There have been countless behavioural science-based initiatives intended to nudge healthier eating. But which ones work and lead to a sustained behaviour change? By Crawford Hollingworth and Liz Barker of The Behavioural Architects. What concepts, tools and styles of intervention are best at getting us to eat healthy foods, or less of the unhealthy foods? This question has been tackled by two French researchers, Romain Cadario and Pierre Chandon[ 1 ], who have collated all the behavioural science-inspired interventions which took place in real-world environments – cafeterias, restaurants and grocery stores – and excluded online or lab-based experiments. They analysed the results altogether (known as a meta-analysis), excluding any studies reporting only intention-based findings, focusing instead on those that could report an objective measure of behaviour such as food weight or energy consumed. They have narrowed down the existing research to 88 studies conducted in the US, Belgium, Canada, France, Ireland, Israel, Japan, Netherlands and the UK, and published in 82 articles. This included studies on children and adults. They categorised the varied interventions into seven different types, across three areas. Area 1. Knowledge based nudges – trying to change behaviour by sharing information and increasing knowledge and awareness. Descriptive nutritional labelling: This includes initiatives like providing calorie or nutritional information on food packaging and on menus, to encourage consumers to select lower-calorie options. It’s becoming increasingly popular and can be seen in many of the well-known international food chains, such as in Starbucks. Bryan Bollinger and his colleagues analysed Starbucks sales data to evaluate the impact of the NYC law mandating nutritional labelling, implemented mid-2008. [ 2 ] Analysing data before and after the change, they found that though there was a decrease in calorie consumption after the posting of calorie information, the reduction was small and was almost entirely due to a change in food choices, with almost no change in drink consumption (its core product type). Some argue that the impact could be improved with better health education about labelling, but often even the most informed customers pay little attention to this type of information. Evaluative nutritional labelling: While also providing nutritional information, this approach tries to make it easier for consumers to understand and interpret the information, with simple wording and visual heuristics –such as colour coding or scoring to highlight recommended items. Typically, green indicates healthier options and red, unhealthy options. Another approach is to place special symbols such as smileys and heart icons on packaging or menus. Impacts seem to vary. Source: Food Standards Agency UK. Douglas Levy and his colleagues compared changes in consumer choices of green, yellow and red foods before and after. There was a modest decline in purchases of food groups labelled red (by roughly 11%) and a small increase in purchases of those labelled green ( 6.6%). Area 2. Affective nudges – playing on our feelings about food to generate an emotional response. 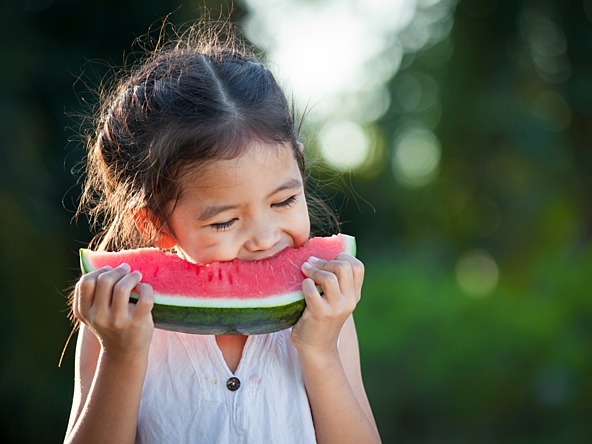 Sensory cues: This type of intervention tries to increase the System 1, sensory appeal of healthy options, rather than informing consumers about their nutritional quality – a more System 2 approach. For example, restaurants might use emotional, vivid, affective descriptions or attractive displays, photos or containers. Two elementary schools in western New York redesigned their cafeterias in the summer of 2011, using sensory cues such as a more attractive menu, fruit displayed in attractive bowls, and vegetables labelled with descriptive names (e.g. ‘celery swords’ and ‘krazy kale’). Andrew Hanks and his colleagues found that this led to an increase in the consumption of fruit ( 18%) and veg ( 25%). Children were also more likely to consume an entire portion of fruit or veg. [ 5 ] They also estimated a modest but significant increase in those consuming the selected fruit and vegetables. Healthy eating cues: These are a direct message to the individual to eat better. The messages can be oral and written and either aim to steer people to choose a healthier option (e.g. ‘make a fresh choice’), or to change their unhealthy choices (e.g. ‘your meal doesn’t look like a balanced meal’). While seeking to change people’s eating goals, from taste to health, these messages might also leverage what are known as injunctive social norms – an indication of what society approves of. The Cafeteria Power Plus Project, initiated in 2000 across 26 schools in the metropolitan area of Minnesota ran for two years. It used healthy eating cues (‘which vegetable would you like for lunch?’) along with other sensory cues (posters in the cafeteria of life-size fruit and vegetable characters called The High 5 Flyers) and healthy eating challenges (a competition to eat three fruit or vegetables per day at lunch for a week, with prizes for those who succeeded) to encourage young children in schools to eat more healthily. Area 3. Action/behaviour-based nudges – focusing on directly steering our choices and behaviour, often by default in what we are offered. Convenience enhancements: Some behavioural interventions can change people’s behaviour without necessarily influencing what they know or how they feel. ‘Convenience enhancements’ do this by making it easier to select or consume healthier options in ‘grab and go’ cafeteria lines, convenient utensils or the pre-sliced, pre-portioned food options currently available at most major supermarket stores. At first glance, this feels similar to salience enhancements. However, convenience enhancements are more about making food and drink choices more physically available – easier to grab, whereas salience enhancements are about making things more visible. This intervention can also make it more cumbersome to select or consume unhealthy options such as putting unhealthy options later in the cafeteria line when trays are already full, or in the middle rows of food bars so they are more awkward to reach. Many studies have indicated that accessibility can affect what people choose. Plate and portion size changes: using behavioural insights on default options, this intervention modifies the size of pre-plated portions of food and drink. This might increase the amount of healthy food offered or, more commonly, reduce the amount of unhealthy food in a portion –such as smaller ice creams or portions of chips. Nicole Diliberti and her colleagues[ 8 ] studied this effect by varying the size of a pasta entree at a cafeteria-style restaurant in Pennsylvania on different days, from a standard portion ( 248g) to a large portion ( 377g). Those who purchased the larger portion did indeed eat more, increasing their energy intake of the entree by 43%. When asked about the appropriateness of the portion sizes, there was no difference in ratings between the consumers of the large portions and of the regular portions. Customers also reported no difference in how much they enjoyed the meal, rating it identically. The only significant difference between the portions appeared to be that customers rated the larger portion as better value for money. This finding not only suggests that large restaurant portions may be contributing to the obesity epidemic through over-consumption, but also that customers are not totally aware of portion sizes. Their results are consistent with other studies in this area and provides compelling evidence in favour of modifying portion sizes to discourage over-consumption of calories and unhealthy foods. Looking across all seven areas, Cadario and Chandon found an average positive impact from the nudges roughly the equivalent of eating 124 less calories or eight teaspoons of sugar or a small glass of red wine. While this does not seem that much, consuming 120 or so extra calories per day every day can lead to substantial weight gain over the course of a year; as much as 6kg in 12 months. Across the three areas and seven types, two of the three areas were statistically significant. Action/behaviour-based nudges had the biggest impact ( 200 calories); plate and portion size changes had the largest impact overall (roughly 350 calories), while convenience enhancements had a more modest impact (around 180 calories). Affective/emotional cues also had modest, but identifiable impacts ( 120 calories). What’s significant about all these positive impacts from different types of nudges is the potential impact from combining them. For example, no study (to date) has tried combining reduced plate or portion sizes and convenience enhancements. Only the first area – cognitive-based nudges – had no significant impact. This is particularly worrying, given the UK government’s recent announcement to tackle childhood obesity by stipulating that restaurants need to include calorie labelling. However, it may still be worth keeping an eye on this one given the behaviours of millennials. They also found that it’s a lot harder to nudge people to eat healthily than it is to nudge them to stop eating unhealthy foods. Impacts were generally larger for initiatives that nudged people to eat less or no unhealthy food, but researchers aren’t sure of the cause behind that. Americans also had a larger capacity to be nudged than citizens of other countries, although it’s not clear why. In the future, we also need to run more trials in grocery stores and supermarkets, as well as in cafes and restaurants, to understand how to have maximum impact on a consumer’s food purchasing journey. Overall, this latest analysis shows that some types of healthy nudges do work and are highly worthwhile, particularly as they are so simple. [ 1 ] Cadario, R., Chandon, P., ‘Which healthy eating nudges work best? A meta-analysis of behavioural interventions in field experiments', Working paper, May 2017; and presentation by Cadario at SJDM 2017 in Vancouver. [ 2 ] Bollinger, B., P. Leslie, A. Sorensen. 2011. Calorie posting in chain restaurants. Am Econ J Econ Policy. 3( 1 ) 91- 128. [ 3 ] Levy, D.E., J. Riis, L.M. Sonnenberg, S.J. Barraclough, A.N. Thorndike. 2012. Food choices of minority and low income employees: A cafeteria intervention. Am J Prev Med. 43( 3 ) 240-248. [ 6 ] Perry, C.L., D.B. Bishop, G.L. Taylor, M. Davis, M. Story, C. Gray, S.C. Bishop, R.A.W. Mays, L.A. Lytle, L. Harnack. 2004. A randomized school trial of environmental strategies to encourage fruit and vegetable consumption among children. Health Educ Behav. 31( 1 ) 65-76. [ 7 ] Rozin, P., S. Scott, M. Dingley, J.K. Urbanek, H. Jiang, M. Kaltenbach. 2011. Nudge to nobesity i: Minor changes in accessibility decrease food intake. Judgement & Decision Making. 6( 4 ) 323-332. [ 8 ] Diliberti, N., P.L. Bordi, M.T. Conklin, L.S. Roe, B.J. Rolls. 2004. Increased portion size leads to increased energy intake in a restaurant meal. Obesity. 12( 3 ) 562-568.